Paris (AFP) – Several European animal and bird species driven to near extinction by humans have made a dramatic comeback in the past 50 years thanks to conservation efforts, a report said Thursday. 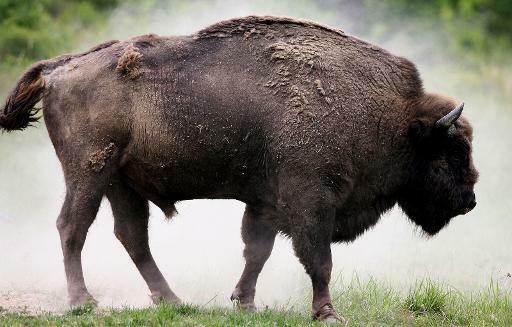 In rare good news for the continent’s wildlife, the report points to a 3,000-percent boost for the European bison, Eurasian beaver, White-headed duck and some populations of Pink-footed goose. The study boasted growth for 17 of the 18 mammal species analysed, which also included a doubling of brown bear numbers and a quadrupling of grey wolves. The Iberian lynx was the only mammal among those studied to have declined in numbers, the rest of which increased their distribution range in Europe by about 30 percent overall since the mid 20th century, the report said. All of the 19 bird species measured showed recovery. “Wildlife will bounce back if we allow it to — this report shows that,” said Frans Schepers, managing director of conservation body Rewilding Europe which commissioned the analysis. The report was compiled by the Zoological Society of London, BirdLife International and the European Bird Census Council, with contributions from scientists from around Europe. Europe has a total of 219 land mammal and 530 bird types. The European bison has recovered to a population of almost 3,000 after going extinct in the wild in the 1900s, said a statement on the report. Decimated by hunters and the loss of their habitat, the bison bounced back thanks to a large-scale breeding programme of the last survivors in captivity, whose offspring were reintroduced to the wild in areas of central and eastern Europe. The White-tailed eagle has also seen a reversal in its fortunes, the statement said — its numbers soared from fewer than 2,500 pairs in 1970 to 9,600 pairs by 2010. Many of Europe’s species reached an all-time low in the 1950s and 1960s following a long history of indiscriminate hunting, poaching and poisoning, as well as habitat loss to agriculture, grazing, pollution and logging. While hailing the outcome of conservation efforts for some species, the report warns that biodiversity as a whole remained on a downward slide. Many others are still declining. Overall, fish, reptile, mammal and bird populations have shrunk by about 30 percent globally since 1970, according to the report. Mammal populations dropped by 25 percent on average and birds by eight percent. Over the same period, the human population doubled to reach seven billion in 2011.